Maybe you’ve seen this widely-used talent review tool. If not, maybe you should get a look at the one used in your company. You (and all your colleagues) have been placed in one of these boxes. Depending on which box you’re in, decisions about your development and pay and future opportunities are being made behind the scenes. It’s not a very well-kept secret in most workplaces. And, for something known as a “best practice,” it’s not very good. Did you know that most HR and management teams conduct an annual “Talent Review” or “Succession Management” process? Do you know how you’ve been classified as a part of that process? Do you have any idea why it matters? You ought to know. Keeping the process secret, making these decisions behind closed doors, and never telling people how they’re viewed by others is patently unfair. These decisions and perceptions have incredible impact. The lack of transparency serves no purpose other than protecting those who participate from having to explain themselves. As a Director with a Fortune 500 company, I participated in the Talent Review process. My input, along with just 6 other people in our ivory tower corporate office, determined how people were paid, promoted and perceived. The impressions we offered had the power to override facts and figures. And the impact of our (mostly unfounded) opinions lasted far longer than whatever formed that impression in the first place. As we reviewed Division VPs across 31 markets, a colleague offered up one of the usual contenders as #1 in the annual rankings. I asked why, because the numbers from that market just didn’t add up to a stellar performance. My colleague blamed a natural disaster in the area for the decline in revenue. So I pressed harder. I pointed out how the share of market had dipped dramatically and that every competitor in the marketplace was, presumably, reacting to the same natural disaster. This “Act of God” was not concentrated in any manner that would afflict our company more than competitors. I was right in my analysis but naïve in my fervor for fairness. It was in that conversation that I first learned that “Talent Review” isn’t a review so much as it is a license to show favoritism and to subjectively champion a select few. Otherwise, the process would be one of metrics review and would not require as much human debate. This is my main objection to the entire process. But I have other issues with it, too. Take a look at the tool most companies use (above). 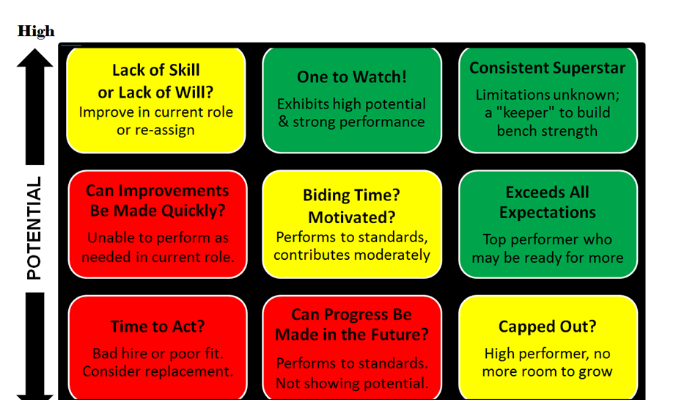 This is a 9-Box Model for Talent Review. The intention is to put every employee into one of these boxes. First, a manager assesses current performance. Is it high, medium or low compared to what is expected in the role? Next, a manager assesses potential and predicts whether the employee’s future potential is high, medium or low. With these two decisions made, every employee gets bucketed into one of the nine boxes. Depending on the company, there may be some additional discussion. Most typical is for executives and HR partners to look at who has been placed in these boxes (at least at the director level). They may have target numbers with caps on how many can reside in each box. These caps lead to debates as each executive argues to keep his or her favorites at the top. Each of the nine boxes has implications. People placed in the green boxes enjoy the “halo effect” I described in my earlier example — past successes carry you through hard times. ● People in these boxes are considered to be the organization’s future bench strength. ● They are more likely to get bigger raises and more recognition as companies work harder to retain them. ● Most companies allocate a significantly higher percentage of their training and development budgets to this group. The majority of employees are positioned inside the yellow boxes. ● They are viewed as steady or high performers in their current roles, but not considered likely to contribute more in the future. ● There is some hint of potential despite their current struggles to perform. ● People in these boxes often feel like they are in a holding pattern. ● They don’t understand why they aren’t considered for development opportunities and don’t receive higher raises or more recognition. People in the red boxes are on the brink. ● They are not showing high performance or high potential. ● They may be on performance plans and may feel they are not given the time or support needed to overcome challenges they are experiencing. ● They get moved to the back of the line when it comes to recognition, opportunities, and pay increases. ● Once in a red box, it’s hard to change perception and move into a yellow box. That past perception lasts a very long time, making it extremely difficult to ever get to green. From the company’s point of view, it’s a necessary process. They need some way, they reason, to identify who to invest in and support. They need some way, they think, to categorize people across all departments so comparisons can be made. This process complete overlooks the fact that circumstances and people change over time. It disregards the importance of entelechy. Regardless of those conjectures, this process is seldom executed fairly. There is no objective way to determine and compare people’s potential. It is absurd to try and bucket people in limiting boxes like these. It is ridiculous to think that a small group can know the circumstances and the people well enough to make these arbitrary assignments. And it is bad management to put so much stock in this process at such a tremendous price to individuals. At a minimum, employees should be told where they are placed and why. Are you seen as “hi-po/hi-per” (that’s HR jargon for high potential and high performance, the upper right green box… the top place to be)? Are you “low-po/low-per” (which means you’re about to get fired)? Or are you somewhere in between, in the zone I call “po-po” (passed over and pissed off)? You can ask. You can also ask what it will take to change the box you’re in. But don’t be surprised if actually moving takes some time. This is annual process and moving you up may mean moving someone else down. Perceptions are not easy to change. They stick, even if your performance improves and even if your potential shines through. Similarly, positive perceptions stick when performance and potential wane. Many an organization practices promotion by foregone conclusion. Whoever got the hi-po/hi-per designation years ago likely ascended without anyone batting an eye. That’s not fair, and it’s not good business. The biggest argument for the 9 box model is that it can be effective when used correctly. In theory, I suppose it makes sense. In practice, however, I haven’t seen this tool be fairly administered or all that helpful in building bench strength, retaining key people or engaging employees. Since so many organizations use it to determine how they will allocate their leadership development investments, why is “leadership development” the number one human capital crisis in Bersin and other studies? Clearly, something is not working. The word “potential” is where I get hung up… It’s where others find this to be challenging, too. How can anyone ever objectively and fairly assess potential? someone or something that is considered a worthwhile possibility. Making a judgment about someone’s potential is inherently subjective. We’re talking about something that is latent, not actual, possible… How can anyone absolutely determine another’s potential? What’s more, doesn’t every single person have some measure of potential? ● Only 41.6% said they weigh innovative and/or unique contributions to the business. ● Only 17.5% reported educational background as a metric. Bringing in more voices who are “on the same page” regarding criteria seems like a reasonable solution. But it doesn’t work that way. I’ve been a part of these meetings where managers, senior executives and HR folks talk about people. The loudest voice — the one others defer to — is usually the person with the most subjective impression of the individual being assessed. Subjective feelings about the individual. 2. Others weigh in with their own anecdotes and impressions about the candidate. Those negative impressions, like the positive ones, are generally based on feelings or personal interaction with the individual. They aren’t related to future potential so much as to past or present encounters. 3. A vote is taken, and the “high potential” label is given or not given based on this discussion. That label (good or bad) sticks and, in future years, few can remember why it was determined in the first place. The list doesn’t change significantly from one year to the next. Ummmm, excuse me, but aren’t those the very sorts of things we could coach people to develop if they have high potential in more relevant ways? As if this weren’t problematic enough, these subjective “high potential” designations don’t even serve the purpose they were intended to serve. The idea is to identify high potentials, provide them with development opportunities and retain them for future promotion. Turns out, that doesn’t always happen. It matters to companies that are wasting exorbitant amounts of time on a process that doesn’t work and, in fact, works against them. It matters to people who are tapped (perhaps in ways that elevate them beyond their capabilities and in ways that, long term, hinder them). It matters to people who are capped, often unfairly, because the person assessing their potential couldn’t see it (and probably didn’t look closely enough). Maybe you’ve seen or experienced something more reasonable when it comes to defining and fairly identifying “high potential.” If so, I’d like to hear about the ways it worked and the positive impact it had. If you’d like to know more about the mistakes leaders make when it comes to people development, start here. If you want to avoid making these kinds of mistakes and build organizational strength by putting people first, schedule a free consultation with People First Productivity Solutions. If you see things differently when it comes to the 9 box model, comment here so we can get all sides represented in this discussion. I’m particularly interested in hearing from those who administer this process and feel certain it is objective and effective in developing the capacity of individuals and of the organization. Be more effective by putting People First! We can help! Top 50 Sales Influencer & blogger, Certified Master The Leadership Challenge, instructor at UC-Berkeley.